What else is there to be said about 2001: A Space Odyssey, a film that’s regarded as simply being one of the best ever made? Libraries of content have been written about this film, endlessly praising and analysing it to bits. It’s no surprise, as every time I sit down to watch it, I get completely caught up in how flawlessly, impressively, and immersively created this film is. 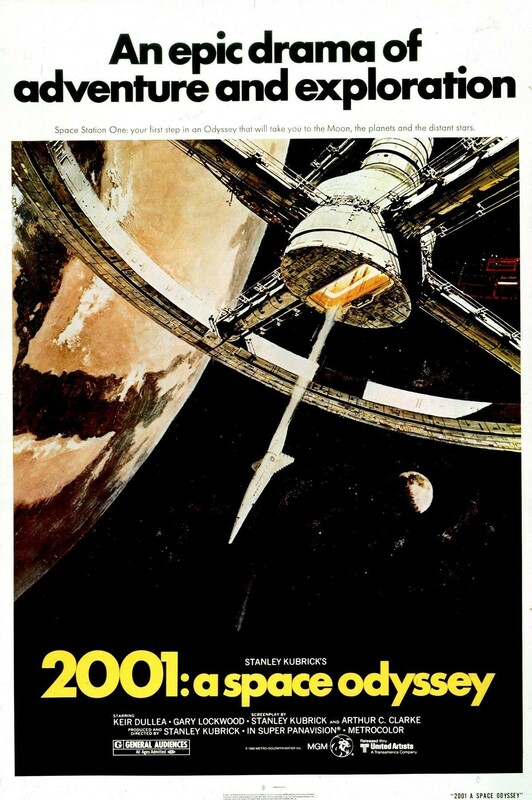 2001 is somewhat split up in four sections: a Dawn of Man sequence that shows the other side of the spectrum of the sci-fi genre by showing the very ancient past, with ape-men being visited by a mysterious force that gives them a deadly dose of human insight and evolution; match-cut to millions of years later where the human race have accomplished space travel and use it to investigate this same mysterious force showing up on a distant moon; 18 months later and Dr Dave Bowman (Keir Dullea) and Dr Frank Poole (Gary Lockwood) have their secret expedition interrupted by HAL, the ship’s AI who seems programmed for the good of the mission, but the bad of the humans on-board; and as for what’s really happening in the last section of the movie is anybody’s guess, but it can stand as one of the zaniest conclusions to any film – which makes perfect sense in a film like this one. Epic is the most overused word on the internet, but it can very properly applied to this film of such stunning vision that can floor its audience scene after scene with its perfection. It can never be properly explained just how enormous the influence this film has had on all others since its release. Its epic space travel effects (both practical and avant garde) surely inspired the similar grandeur of Interstellar, its examination of AI’s turning evil has been seen in a number of sci-fi films since (most recently in Ex_Machina), and even its vision of space and the ships that inhabit it was a massive influence on Star Wars, released just nine years later. I was lucky enough to finally check out this film on a cinema screen recently as it’s part of the Great Britain Retro Film Festival at the Windsor Cinema. It was an incredible experience, despite the film’s image being boxed in in the already small-ish cinema screen, although the sound was excellent, booming into the audience the defiant stomping classical music sounds of Richard Strauss, the cheeky waltz music of Johann Strauss II , and the eerie, haunting drones from György Ligeti. Despite its enormous reputation, there’s no other film that’s anything like this one (not even it’s disappointing, but still slightly incredible sequel, 2010: The Year We Made Contact). Filmmakers since have been massively influenced, and audiences get turned into cinephiles (or just get left completely baffled) by this stunning sci-fi film that very much changed the way films are made in regards to their storylines, effects, and impact on the audience. It isn’t outdated in the slightest (apart from the fact it’s been 14 years since 2001 and we still don’t have any space travel. We still don’t have any jet-packs!) and is worth a watch for those who have seen it plenty of times before or if they’ve never seen it at all.